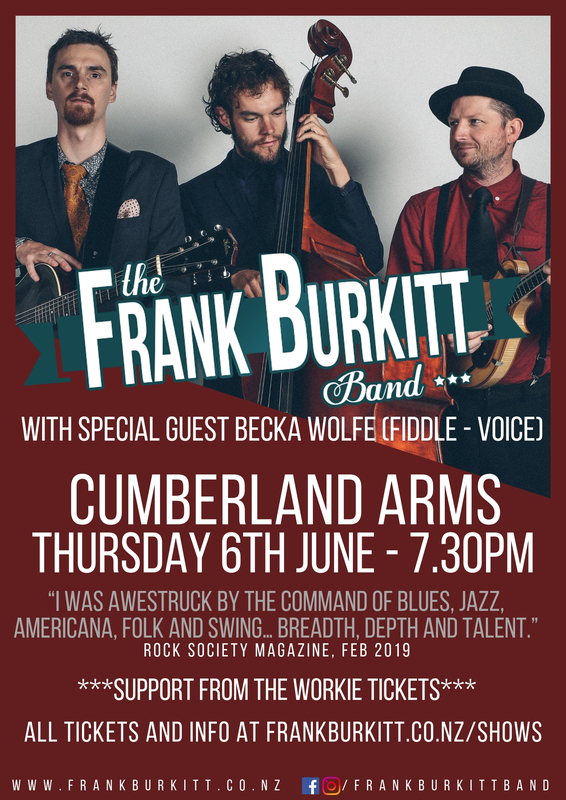 All the way from New Zealand (via Scotland) The Frank Burkitt Band are delighted to be performing at The Cumberland Arms in Newcastle as part of their debut UK Tour in May and June 2019. Following on from 4 months of shows in the antipodes, where they were announced as winners of the Vodafone NZ Music Award for Best Folk Artist 2019, the band will be travelling the UK for 6 weeks to as far north as Inverness and as far south as Falmouth. A set with the band can be described as American roots music infused with folk, blues, country and a sprinkling of swing. Unique and profound songwriting, arranged with precision and creativity. A true genre spanning performance awaits. Add to that Frank’s rambling anecdotes and you are in for a special night that will both move and entertain. They will be joined on their travels by the enchanting Becka Wolfe who will be adding sumptuous fiddle and vocal harmony to the band’s songs as well as singing her own songs in Arabic, French and English. Also supporting on the night are The Workie Tickets, multi instrumentalist musical agitators from Tyne and Wear with a passion for politics and music. The award winning songwriters play a range of contemporary and traditional NE & English folk, Americana & self penned ditties destined to make your passions rise and heart race! They sing of love, loss, lust, Brexit, revolution and all in between. Their on stage craic is also not be missed.